Much has been made of the whole ammo menu concept at the recent Luckygunner.com Blogger Shoot. Most people, myself included, thought it was a stroke of pure and luxurious brilliance. Print up a menu of available ammunition, take copies up and down the firing line, get people to place orders, and have ammo delivered right to your gun, so to speak. A few questions have been raised about the idea of having ammo girls take orders and deliver ammo. Does that have some negative impact on the existing stereotypes of shooting being a good ole boys club that’s not welcoming to women? While admittedly attractive, the ammo girls were tastefully dressed in what one might refer to as shooting tennis attire – black LuckyGunner.com shirts and black tennis skorts. What no one has mentioned is that the ammo girls, and ammo guys, were mostly employees of LuckyGunner just chipping in to have some fun and do something special at the event. I admire the playful attitude they displayed with the whole ammo menu thing. 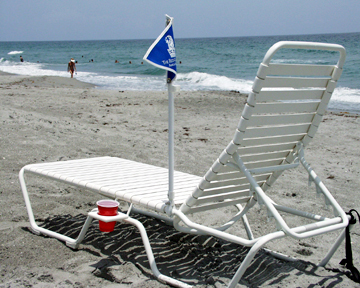 Perhaps next year, they will get those chaise lounges with little red flags to raise when you need something – like the ones at Caribbean resort pools. The beef I have is that no one is commenting on the ammo guys. You know, the ones working the ammo table and mobile warehouse (read: U-Haul truck) in the blazing Tennessee sun. It was like the ammo bar where the ammo girls got the orders filled. While the ammo guys were not wearing skorts, they were attired in similar LuckyGunner black shirts and khaki shorts. I do have to say that a couple of the ammo guys were showing just a bit too much leg for my taste. Tone it down next year guys! Some of them may have been wearing skorts underneath, but I didn’t ask and certainly didn’t want to know. All in all the ammo menu thing, staffed by ammo girls and ammo guys, was great fun. The ammo girls definitely had the better deal as they got to shoot a lot of the guns while the ammo guys just sweated in the truck. If I ever have to be an ammo girl or ammo guy, give me a pair of skorts and let me work the shooting line. I’m not even going to pretend I ‘get’ the controversy. I feel like a nothing has been turned into a something. I don’t think we were all standing up and clapping for Angela because she was attractive and in a skirt. I wasn’t saying “Thank you!” to the ammo girls because they were dressed like any other woman might on a hot day, it was because they were fetching me ammo and cold water. Yeah. I think some people have turned this into a big deal when it was really nothing. As one of the few women in attendance, I’ll say that I enjoyed their presence. They made the weekend even better.